There’s a movement to build a more cohesive and useable software platform that leverages marketing automation platforms (MAPs) and sales automation platforms (SAPs) to enable content marketers to drive more impact across their organizations: the Content Marketing Platform. 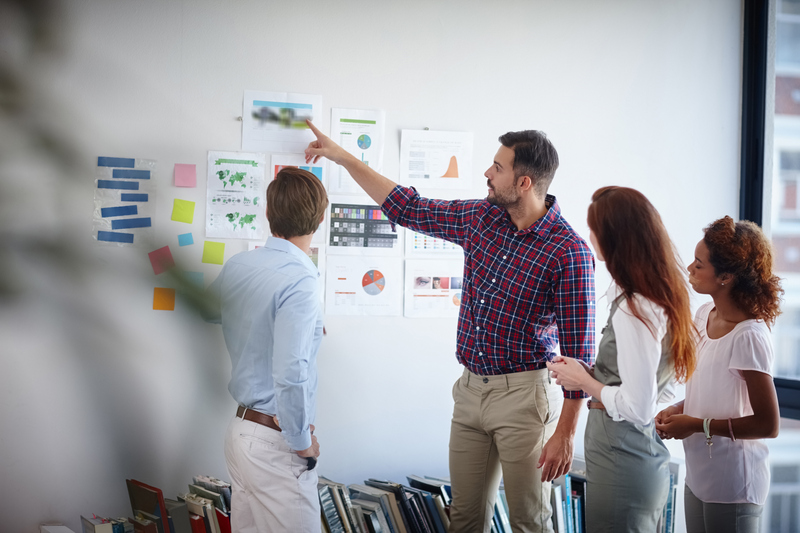 Key process areas are being established such as content strategy, production (with an editorial calendar and workflow management), distribution and analytics. 57% of leading marketers predict an increase in marketing analytics spending. There has been a mind-numbing proliferation of technology vendors and solutions to address the needs of content and digital marketers. 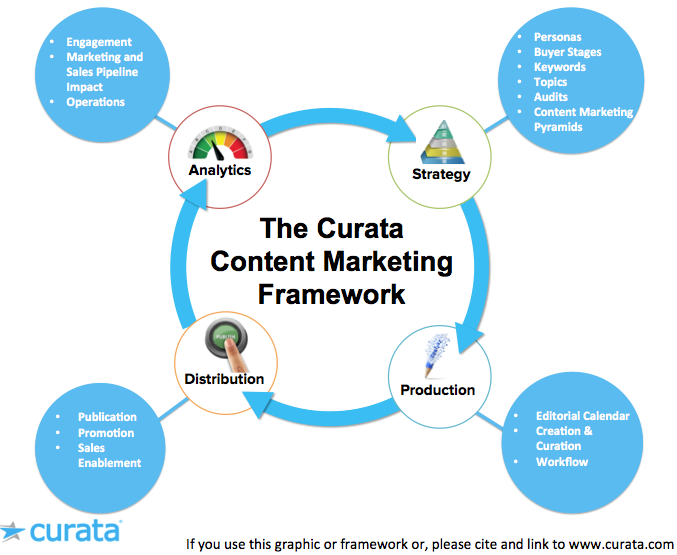 Curata’s content marketing tools map has increased from 40 vendors to over 130 vendors in its most recent version. Limited budget for staff and program spend. Creating enough quality content on a regular basis, whether in-house or externally sourced. Distributing content across multiple channels, including publication and promotion. Measuring the impact of content, i.e., what works and what doesn’t work to drive awareness, leads and sales enablement. A Content Marketing Platform is a software solution that helps marketers be more successful in driving awareness, leads and revenue from their content. This platform enables a data-driven, scalable, and multi-channel approach across four process areas: strategy, production, distribution (publication and promotion) and analytics. The below framework provides additional details about the four key process areas addressed by a CMP. Ultimately, a CMP helps content marketers develop and execute an effective and efficient content marketing strategy. The following frameworks offer additional perspectives as to what processes and related tactics are addressed by a Content Marketing Platform. 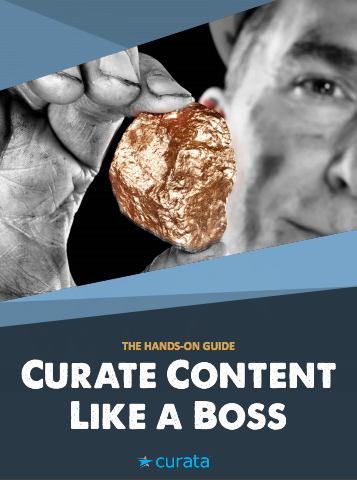 Joe Pulizzi and Robert Rose assembled the framework based upon their own success at the Content Marketing Institute. 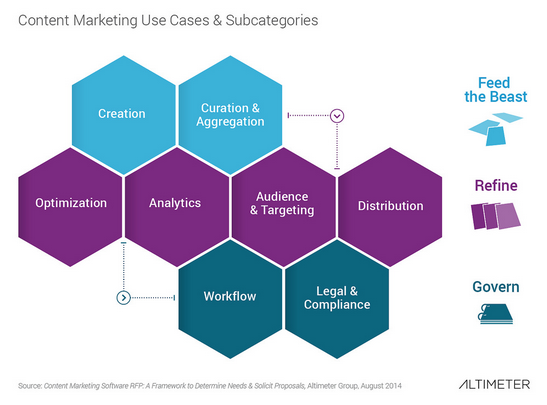 These areas represent common elements of a high impact content marketing practice. 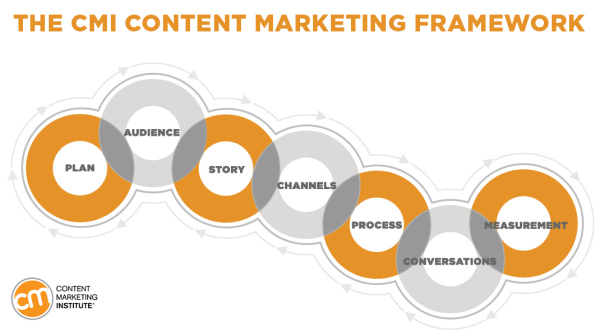 Lee Odden, a thought leader in the content marketing space and CEO of TopRank Online Marketing, put together this simple to follow, yet powerful, framework for successful content marketing. Rebecca Lieb of Altimeter did a very thorough job identifying the more tactical areas required to fulfill three key use cases for content marketing: Feed the Beast, Refine (including content analytics, segmentation, and promotion), and Govern. 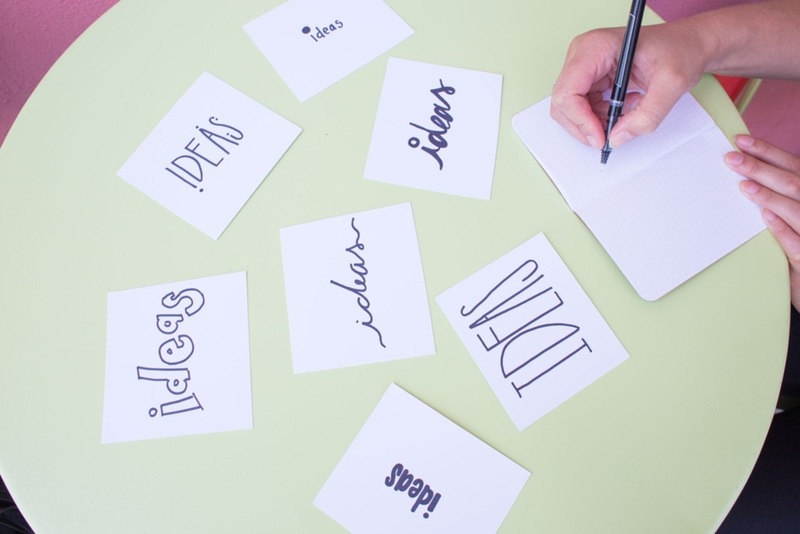 Jay Baer of Convince and Convert put this framework together using the knowledge gained from helping many big brands form their own content marketing strategy. His seven-step approach helps kickstart the process of formulating a content strategy, a process he says can take up to 60 days. 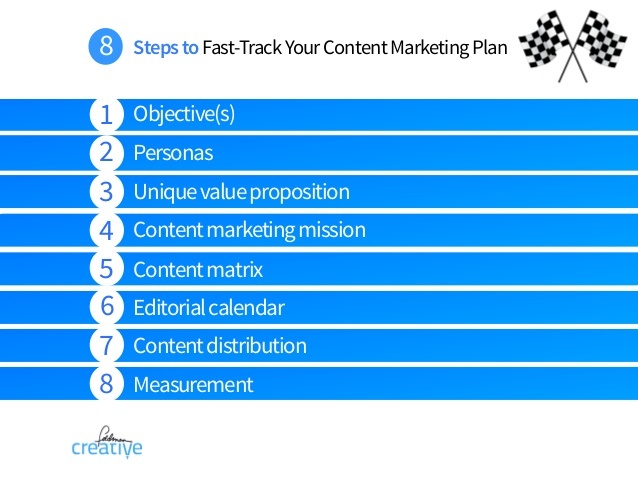 Content marketing expert and consultant Barry Feldman created a comprehensive post outlining this eight-step content marketing plan to quadruple your leads. 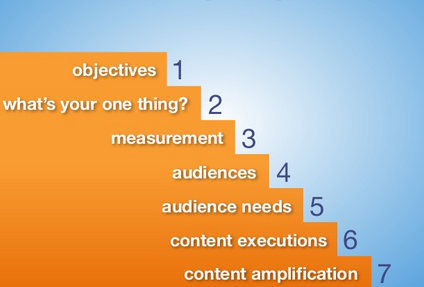 Determine the goals for your content marketing plan. Know your content marketing audience. Incorporate your brand into your content. Determine what information your audience seeks. Make your content attractive to prospective readers. A content management system (CMS) for the web is NOT a Content Marketing Platform. A CMS is designed to run web sites (e.g., corporate web sites, blogs, content repositories), and to avoid the need for manual coding. Their main function is to “store and organize files, and provide version-controlled access to their data.” [source] CMPs are designed to orchestrate the development, delivery, and analysis of content to CMSs, as well as many other types of digital media entities. A foundational element of a Content Marketing Platform is its ability to interact within an ecosystem of marketing teams, processes, and technologies, without being the sole hub for content delivery. Examples of CMSs include WordPress, Drupal, Joomla!, Percussion and Uberflip. The value enabled by a CMP cannot be provided by a marketing automation platform (MAP) such as Marketo, Eloqua, Pardot, Act-On, etc. MAPs are designed to plan, execute, and measure demand generation campaigns and the interaction with leads from these campaigns. MAPs are lead-focused, not content-focused. However, MAP data is a key component of the value provided by a CMP, as detailed below. Content repositories: Ask anyone that has attempted to stop the use of SharePoint systems how likely it is you’ll get everyone to use only one content storage area. Therefore a CMP should—either today or as part of its roadmap—interoperate with different content repositories. Email as a method of collaboration amongst internal and external teams will not be replaced anytime soon. Attempting to get all parties involved in content marketing onto one system only reduces the potential for technology adoption. Therefore a CMP should interoperate with email applications, and be able to track communication about specific content pieces as part of orchestrating the content production process. A CMP enables orchestration of the content production process in a minimally invasive manner. Team alignment: A high impact content marketing strategy requires alignment and interaction with many functions across marketing. For example, content marketers may have to interact with product marketing for content creation, social media for promotion, or marketing operations for analytics. A CMP enables collaboration across these different teams without requiring all of them log into the CMP, increasing its adoption and impact. Content creation tool: Some CMP vendors require content creation within their own platform, necessitating all content creators to be trained on system usage and to interact with it on a regular basis. 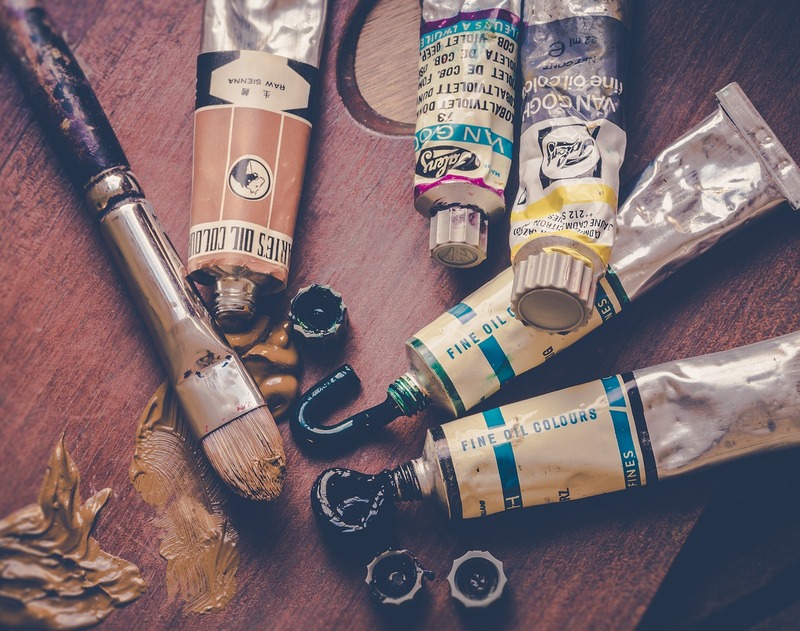 Other CMP vendors track content creation progress in a less process-invasive manner, enabling the continued use of industry standard creation tools such as Microsoft Word, Google Docs, Microsoft PowerPoint, Google Spreadsheets, Photoshop, and WordPress. content format, e.g., video, text, images. type of content, e.g., ebooks, white papers, infographics, blog posts. source, e.g., created, curated, licensed, outsourced, crowdsourced content. distribution channels, e.g., paid, earned, owned. content internal to or external to the CMP. A CMP enables the measurement of your content’s impact across awareness building (such as social channels, Google Analytics), demand generation (such as leads generated and influenced), and sales pipeline impact (such as sales opportunities generated and influenced). This is only possible if a CMP is capable of aggregating data from many applications, both within and external to your company. Even better is if a CMP can measure the pipeline impact of content published off-site on someone else’s blog or media property. 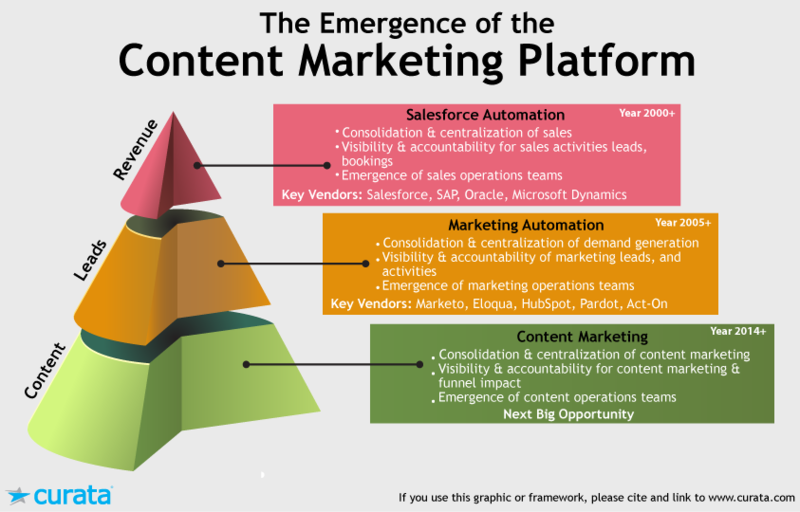 Where Should a Content Marketing Platform Sit in Your Marketing & Sales Technology Stack? To understand how a CMP fits into your technology stack, begin with a basic question: What are the ultimate objectives of marketing and sales technologies? The bottom line—or should I say the top line, is REVENUE. That’s where our story begins. Right around at the turn of the millennium there was a shift from the expensive, outbound sales model to inbound telephone and Internet-enabled sales. This change was driven by the advent of the Internet and the resulting online presentation tools such as WebEx, which effectively enabled salespeople to perform demonstrations of software and presentations—and ultimately close deals—without ever meeting their customers in person. But the growth of insides sales teams was chaotic. Unlike outside sales people who each carry their own physical rolodexes, inside sales teams manage their leads in spreadsheets. How are leads and territories assigned across a sales team? Sales managers need to keep tabs on sales activities being performed by their teams. A sales account executive needs to know what prior interactions a company has had with an account. How can sales management easily report and predict their pipeline revenue across large and sometimes geographically distributed sales teams? Let sales managers hold their teams accountable in terms of their sales activities. Provide a means to scale sales teams. 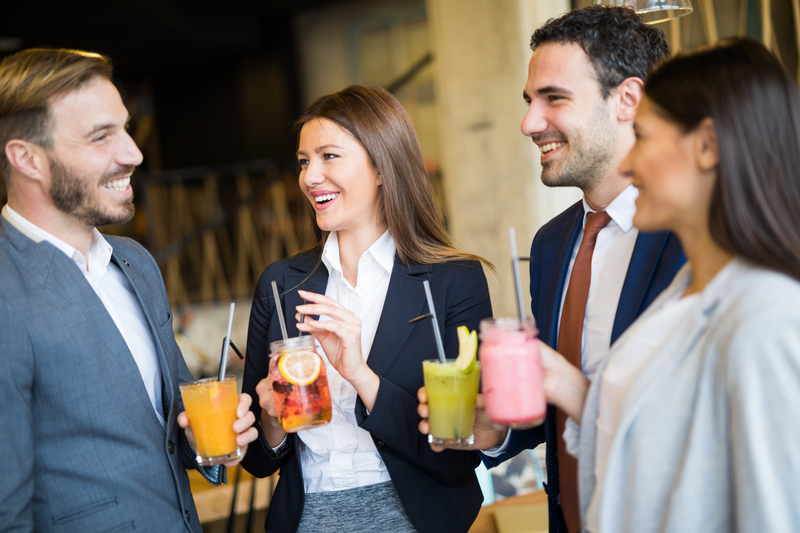 Most importantly, they provide value for the everyday sales representative: convenience, efficiency and a single unified interface as a source of leads, activities, and deals. 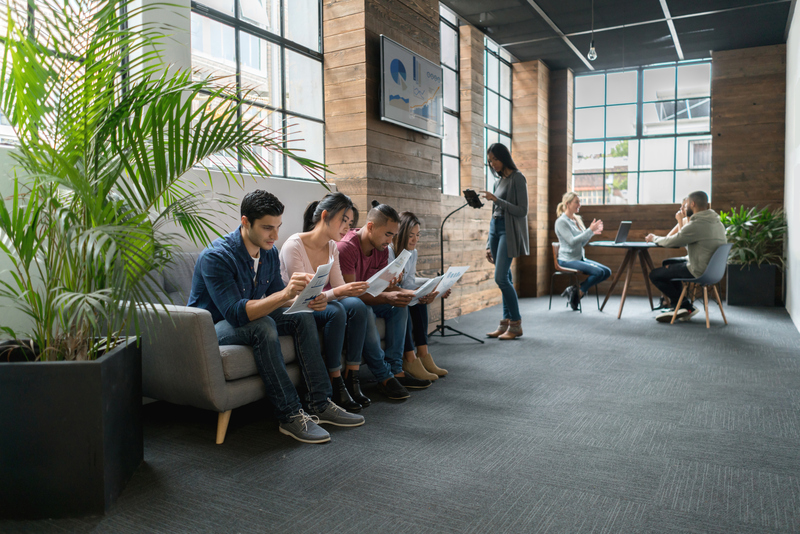 With the growth of inside sales teams, there was increased demand for leads, particularly online-sourced leads, to feed these teams. Pressure rapidly shifted to marketing teams to create more and more leads. 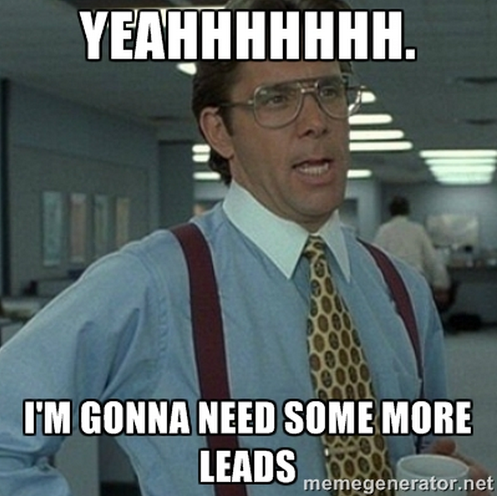 How do demand generation teams effectively manage marketing-generated leads? How can marketing operations have a single unified view of all marketing leads and associated marketing activities against those leads? What’s the best way for marketing to measure the effectiveness of their demand generation campaigns? About seven years later in 2007 or so came another type of platform in the emerging stack: Marketing Automation Platforms (MAP) from vendors such as Eloqua, Marketo, Pardot, Act-On and to some extent, HubSpot, amongst many others. Keep a single unified repository of all leads. Track all digital marketing activities associated with those leads, be it on a website, via email, or through pay-per-click campaigns. Easily push qualified leads into Sales Force Automation systems. Suddenly, marketers now had insight, visibility and self-accountability for their lead generation and nurturing campaigns. SFA platforms fuel revenue by tracking and supplying sales opportunities and leads. Marketing Automation Platforms drive SFA by supplying marketing qualified leads. But what drives the marketing activities and leads of Marketing Automation Platforms? Content! 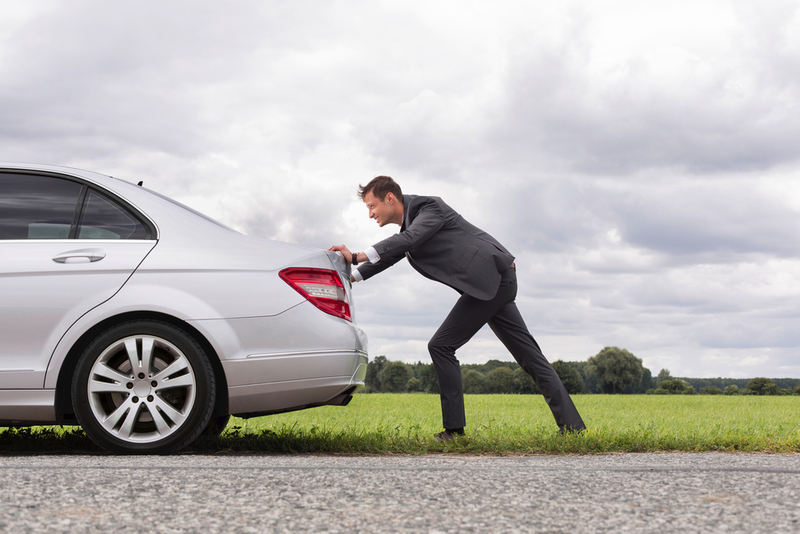 Like a car without gas, marketing automation can’t get very far without content. Content is needed for everything from a website (which is tracked by marketing automation), to email campaigns, to even pay-per-click landing page offers. 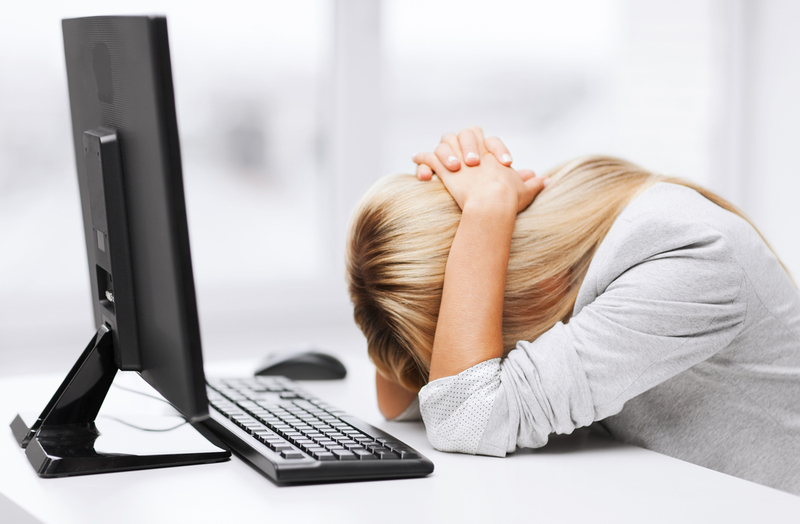 If not for content, many of marketing automation’s key components would cease to function. Drip campaigns come to a halt if there is no content to drip to leads. Lead scoring would stop without content for a lead to browse on a site. With no content, many demand generation campaigns would come to a halt because there would be no enticing offers for many lead capture landing pages. Content is crucial to the customer acquisition process—so what tools and technologies can support this? There are myriad content marketing tools out there. But there’s still a need for a Content Marketing Platform (CMP) that sits on top of the Marketing Automation Platform and Sales Force Automation system. A CMP needs to supply content downstream to generate and nurture leads, that are then converted to opportunities and revenue by sales. Similar to the pains that demand generation and sales teams have gone through in the past, many of today’s content marketers have little accountability and transparency in terms of how their content is performing. Their content and the associated metadata is often warehoused and stored in multiple disparate systems and spreadsheets. Have a unified, consolidated view of their entire content supply chain from ideation to production to promotion. Have top-down visibility on how their content is impacting lead generation and marketing pipeline, and sales pipeline and revenue generation. With a CMP, content marketing managers suddenly have a data-driven and scalable way of managing their content supply chain and understanding their contribution to business growth. 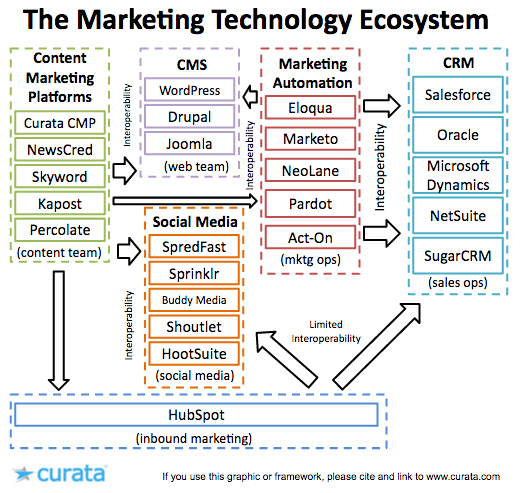 Where Does a Content Marketing Platform Sit in the Marketing Technology Ecosystem? The following figure depicts the location of a CMP in the marketing technology ecosystem. There are certainly many other categories and vendors within this ecosystem. However, these are the most important integrations and/or handoffs that need to occur for effective implementation of content marketing. Who Sells a Content Marketing Platform? You can find a lot of companies that may appear to have Content Marketing Platforms from a cursory view of their website. However, many offer point solutions and are more aptly described as content marketing “software” vendors, and/or don’t meet the broader definition provided at the beginning of this post. We have assembled a list of the current vendors who have begun to solidify the vision of a Content Marketing Platform. Each of the following companies is further defined according to different categories to make it easier to distinguish each company’s area of expertise. The Curata CMP Content Marketing Platform is designed specifically for B2B marketers to help drive leads and revenue from content. Key components to find in Curata CMP include strategy, production (e.g., calendaring, workflow) and analytics. Kapost’s Content Marketing Platform allows marketers to collaborate, distribute, and analyze all content types within a single platform. This was a startup company acquired by Oracle in 2013. It has now been absorbed into the Oracle Marketing Cloud under the product name Oracle Eloqua Content Marketing. Percolate is a leading social relationship management platform that also offers unique content management capabilities for large B2C companies. NewsCred helps brands manage the entire content marketing process on one platform. By managing content creation, distribution and measurement, it enables vendors to scale and streamline the entire customer experience. These companies by contrast, have a core value with content creation services that they either deliver or field to a marketplace of professionals. On top of the services, they have built content marketing software. Skyword’s motto is “Moving Stories. Forward.” Skyword provides access to a community of thousands of freelance writers and videographers, an editorial team, and program managers. The Skyword Platform makes it easy to produce, optimize, and promote content to create meaningful, lasting relationships. Contently meanwhile, helps you “tell great stories.” It helps leading brands build loyal audiences through premium, original content, and also offers software that lets marketers orchestrate content creation, approval, distribution, and measurement. The modern practice of content marketing has only recently begun to reach the masses. 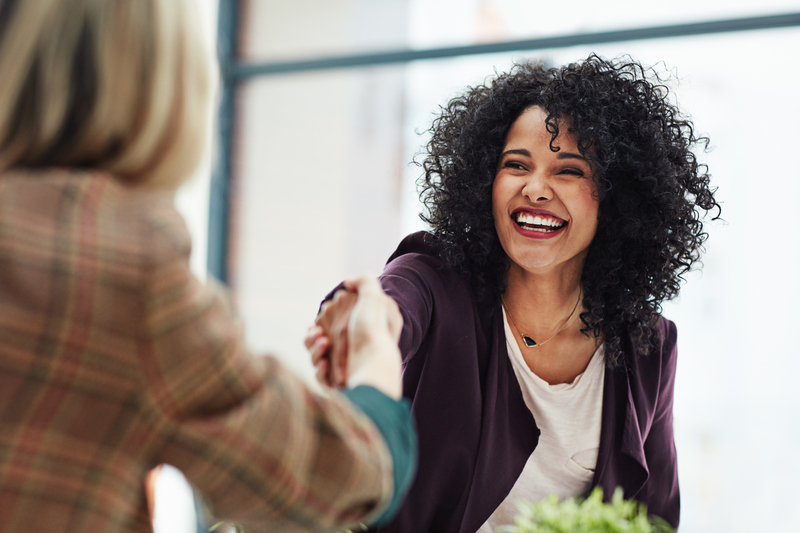 Organizations are beginning to staff their teams with content marketing experts, and processes are beginning to take shape to better tap into the power of a common focus (and investment) around content. The proliferation of content marketing vendors is therefore due to the many challenges (and opportunities) for marketers. In the future, the Content Marketing Platform will sit in the center of this technology landscape. This will enable marketers to streamline their processes, and ultimately better scale content operations. So, where to start? Look within your own organization to pinpoint specific needs. Do you have someone in place to lead content marketing? Have you developed a content marketing strategy in alignment with other parts of your organization? Are you using an editorial calendar to facilitate alignment and to help execute your strategy? Are you quantifying the return on your content marketing investment through more advanced metrics? This post was co-written by Michael Gerard. Pawan, Michael: Whew! Time to stop and catch my breath… What a wonderfully comprehensive and actionable post, guys! As a solo professional writing for and consulting with my clients, knowing what they need in terms of content marketing, and how they need to do it, is critical for me. This post goes a long ways to helping not only understand those needs better, but how to communicate it to my clients. Great stuff! Thanks for your kind words, Bobby. Content marketing is quickly growing and changing area of marketing. I am glad our post was helpful to you. One note is on the CMS part. WordPress, Joomla and CMS alike have indeed limited to do with CMP. More enhanced CMS systems like Sitecore, Sitefinity, Hippo, Adobe CQ5, EpiServer have way more options than just being a CMS and tend to be fully CMP software. Thanks Ebo. Very glad that you found the post to be a good read. Some of these companies you mentioned are beginning to incorporate CMP-like features; however, they do not meet the definition of a CMP because they are not interoperable with multiple other CMS’s since they are so tightly coupled to just one. Automation software and platforms have really changed the way marketing people work. As a content marketer I find social media automation tools extremely useful and time saving. I’d love to try out a content marketing platform. 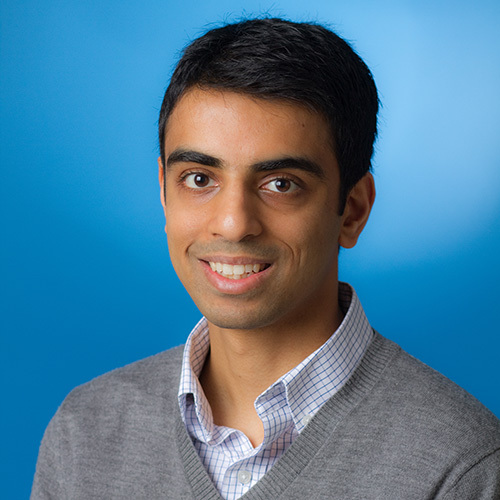 Great share … Google is giving more importance to unique and effective content. The attractive content also helps to attract the visitors to stay and read the content of your website. I would like to share some information about a leading content creation agency in Dubai for effective content marketing strategy. We have been using bloomfire – would you care to comment on how you see bloomfire as a content platform? when it comes to managing social media sites and sharing contents. Someone has to create the content. It is best when it comes from the experts inside the organization. Unfortunately, they are usually too busy to write. We figured out how to efficiently pull content out of their mouths via a unique interview process. Depending on the fast modern technology expansion, you need a wireless router that can be used for the upcoming several years. If you are likely to use it with a PC, the router’s match-ups with the Computer should be validated. I’ve been searching a lot around this topic and I’ve also found some information about Contentools. Looks to be suited to different types of users and scenarios as well. What’s your opinion about it? @disqus_3a33cPdYdG:disqus have you tried this tool, by any chance? wonderful post. Thank you for sharing your knowledge with us. I like this post. Good explanation in detail that helps people. This information helpful for me. I like this post. So many useful information! I think we might need a CMI, though I wonder if they need to be compatible with other software? We’re using getresponse for marketing automation. Do they need integrations or something? Having trouble finding a good Car Finance Services In Delhi? Let Success Key Financial help you with your used car purchase. We offer competitive rates by comparing all loan offers to low rates on both new and used vehicles. Success Key Financial is offering 10% discount on your first service with us.